A list of draconian new austerity demands handed to the Greek government in Brussels Sunday ignited a global backlash against Germany, German Prime Minister Angela Merkel and finance minister, Wolfgang Schaeuble. #ThisIsACoup became the top trending hashtag on Twitter worldwide – and is #1 in Germany and Greece. 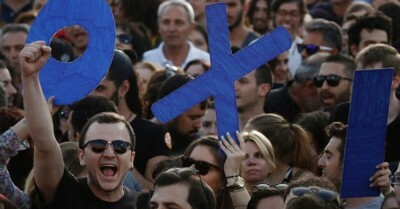 The tag was attached to tens of thousands of angry comments denouncing Germany’s aggressive demands that the Greek parliament pass new severe austerity laws within days to raise taxes, privatize public assets and cut back on pensions. The weekend showdown came to a head on Sunday night as Eurozone leaders Angela Merkel and President François Hollande of France presented Greece’s prime minister, Alexis Tsipras, with a new ultimatum. The hashtag originated Sunday evening from Sandro Maccarrone, who is a physics teacher in Barcelona, Spain. He tweeted: “The Eurogroup proposal is a covert coup d’etat against the Greek people. #ThisIsACoup.” Within hours it had been used nearly 200,000 times.